This is a small work for me and I enjoyed the process. Since I'm typically working in the 4-6 ft range, it is amazing how rapidly things happen in a two foot world! There was an older oil under this panel that had been sitting around in the studio for about a year. Now that 2018 had begun it felt like a good time to have another go at that image. My first thought was to improve the existing oil but as soon as the first brushstroke was applied, I realized that I didn't want to just tweak what was there. Now I had an opportunity to do something much bolder and that's were the orange background came in. I'm typically working with 1/2" width brushes and they cover canvases quickly, even at 5 or 6 feet. 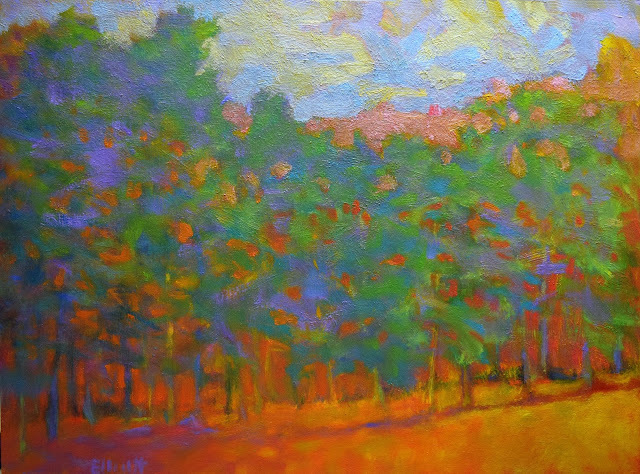 In this case, it was like having making an acre of orange forest in minutes with the painting asking, "OK, did that, now what?" I was great fun to 'locate' the green trees rather than representing them in detail. The bright greens held their own against the orange background nicely. The yellow foreground in the bottom right is all that remains of the original painting and I used that area as a bright inspiration for everything that followed. There are always a lot of options for sky besides blue and that was my plan. First I put down a bit of blue and purposely left remnants of the original oil in the sky. My intention was to bring in another color over the blue creating something different. Hmmmmm, those remnants are nice with those random bits of yellow mingling with the blue... an unexpected surprise that made a common blue sky a lot more interesting. OK then, add another, brighter blue to the mix and create a glowing sky - push the blue. From there I added more dark, contrasting areas in the trees and it was done. ...now to figure out those other 4-6 foot canvases waiting for their solutions.